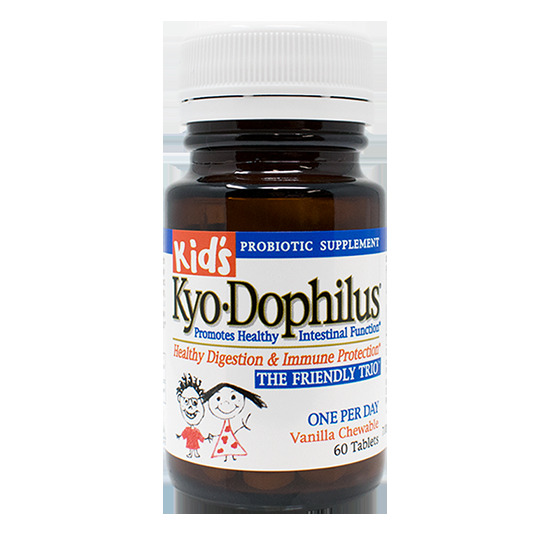 Kid’s Kyo-Dophilus is carefully formulated with The Friendly Trio™ probiotics – three specially cultured, non-dairy, heat stable, stomach acid resisitant, human strains of beneficial bacteria. This tasty, vanilla-flavored chewable helps build and support a healthy digestive and immune system.‡ Take every day to promote proper intestinal function & general well-being.‡ Guaranteed stable at time of consumption. Dextrin, fructose, cornstarch, calcium carbonate, magnesium stearate and vanilla flavor. FREE OF: preservatives, sodium, dairy, yeast, gluten, artificial colors. Dairy Free. Chew one tablet with a meal daily. For children under four and infants, crush 1/2 tablet in food or juice.